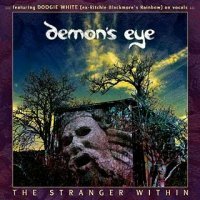 Someone once said to me that no music is unique, but it is all uniquely derivative – I can't really say that about Germany's Demon's Eye as, considering they have been a Deep Purple tribute band for over thirteen years, they couldn't sound like anything else really. However, this is a collection of original tracks and, just to add authenticity to the whole Purple/Rainbow comparisons, they have enlisted former Rainbow vocalist Doogie White to sing on it and also to write the lyrics for the title track. I absolutely love 'Sins Of The Father', which to me epitomises the sound of the album, and I believe the aim was to achieve something which would be as close to Blackmore-era Purple as it could be without actually having him on there. It's certainly done that with the fabulous Hammond organ work by Florian Pritsch ("I was so obsessed with Jon Lord that I managed to talk my parents into buying me a Hammond when I was 11!") and the guitar riffs of Mark Zyk which are so obviously gleaned from every Purple song that has ever been written. Maik Keller on bass and Andree Schneider on drums make up the perfect rhythm section and would make Glover and Paice proud in the execution of their duties. Doogie has been quite a follower of the band and has actually performed with them on several occasions before this album was even thought of, and was over the moon when he was invited to record with them. As predicted, the songs fit his voice perfectly and this is just one more chance to hear him doing what he does best. Having also performed in the past with Jon Lord and having the encouragement of Roger Glover, I think this is the closest thing we've had to classic Deep Purple for a long time!